When the United Nations launched the World Network of Biosphere Reserves in 1970, one of its main goals was to conserve landscapes, ecosystems, individual species and genetic variation. Core protected areas within a biosphere reserve, such as national and provincial parks, provide the physical space—or ecosystems—species need to thrive. In eastern Georgian Bay, we have a mosaic of ecosystems ranging from forests and rock barrens (naturally open habitats of rock, shrubs and trees) to wetlands and rivers. Each of these areas provides important habitat for hundreds of species. Habitat loss is the single biggest threat to plant and animal species, both globally and locally. Once a natural area is disturbed or destroyed, it is very hard to restore it to its previous state. In addition, individual habitats need to be at least somewhat connected to allow species to breed, feed and find shelter. When a large habitat is divided by roads, power lines or by human settlements, it gets sliced into smaller patches that may not meet species’ needs. Well-connected habitats supporting a wide range of species are important because they act like a natural buffer to the pressures of human activities, extreme weather events, climate change and invasive species. Highly diverse landscapes can absorb these shocks better and help support ecosystems and their wildlife. Georgian Bay’s coastal areas and inland lakes are threatened by road construction and new buildings, as well as boat launches and other changes to the shoreline. Those changes could include logging, mining rock and gravel, moving soil, dredging and blasting. Roads and development projects also create pathways for the spread of invasive species, such as the phragmites reed, which you may have seen growing in tall, dense stands along roadways. Researchers can measure many different threats to biodiversity. By understanding these threats, we can see which habitats are priorities for protection, which areas need restoration and where we can best locate human development to make it more sustainable. The researchers’ findings can translate into sophisticated maps showing all the different threats to landscape biodiversity. Simple map layers would include roads and urban areas. More complex maps would calculate the area of connected habitat, giving high scores to areas with more biodiversity. They could also do this for a particular species, or combine the habitat needs of several species to show the ideal habitat for protecting species at risk. First Nations territory, national or provincial parks and Crown lands managed by the Ministry of Natural Resources and Forests often contain the most high-value biodiversity areas. These contain important habitat (such as forests, grasslands and wetlands) for our species at risk. High human footprint occurs along transportation routes and around areas with larger populations, such as Parry Sound and Honey Harbour. Remote areas that are least accessible by road show the least human influence. 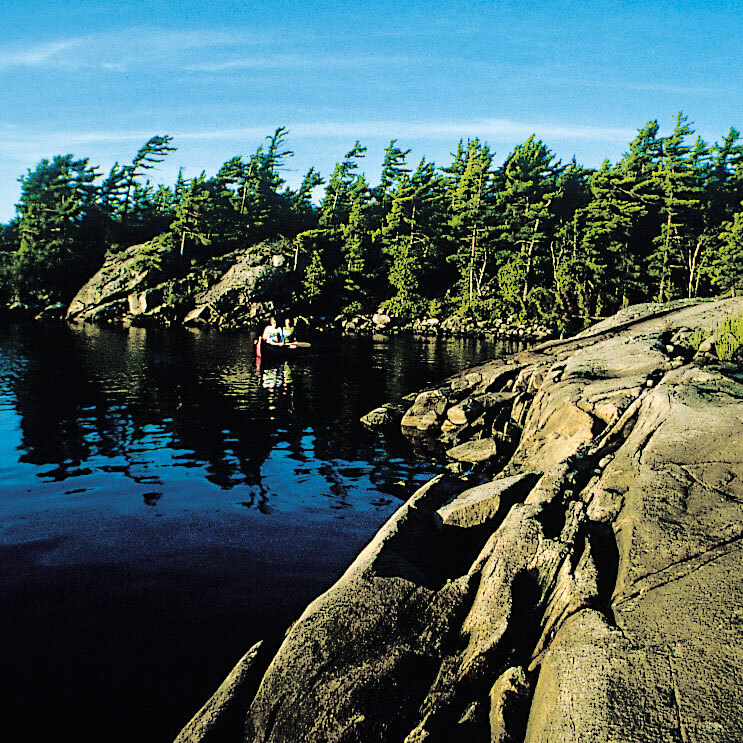 The Georgian Bay Biosphere Reserve is a globally unique freshwater archipelago of islands, acting as a natural corridor for species movement across land and water. Relatively few roads and lower development have made this region an important place for species conservation. However, with more local development, expanding road networks, the spread of invasive species and climate change, our biodiversity is at risk. Think about your own eco-footprint, how you develop your property and how these actions help or hinder wildlife habitat. Leave your land as natural as possible: fallen branches create salamander homes and add new soil. As well, dead standing trees (if in a safe location) provide shelter for birds, bats and small mammals; a shoreline buffer of native vegetation preserves important habitat and improves your water quality; and by turning off outdoor lighting at night, you’ll make it easier for nocturnal birds and other wildlife to navigate. In addition, to make sure our conservation efforts are as effective as possible, our communities need to adopt best practices for development, including building roads with fencing and ecopassages to protect wildlife and allow for safe crossings. Culverts need to be appropriately sized and located to support aquatic habitat for fish and other species. And finally, our land-use plans need to that ensure habitats are connected in order to protect large natural areas from fragmentation.